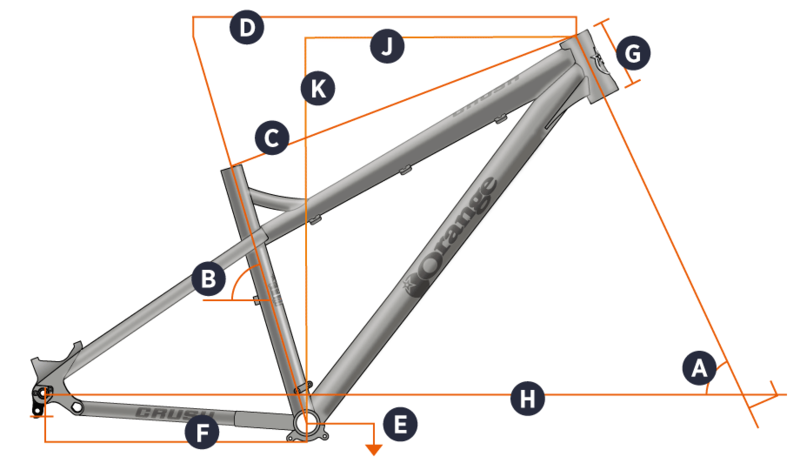 The frame is bang on point, the rear triangle features a 148 Boost bolt-through axle, giving unparalleled stability to what is already a strong and rigid chassis. The 2019 model's geometry has been tweaked with a 64° head angle which, matched with the Orange Crush's long top tube design, adds an extra degree of confidence in the handling. With a short 50mm stem the rider is right where they need to be for direct control and weight distribution. Short chainstays make climbing as sweet as ever for a long-forked hardtail, those stays now reshaped with a CNCed yoke on the chainstay to allow plenty of clearance for a more than chunky 2.6 tyre. The Orange Crush's unshakeable attitude is as strong as ever. Built tough to be ridden hard, where it really excels, on the rough stuff. Sunset Cycles offers the 2019 Orange Crush RS 27.5 hardtail mountain bike with up to 48 months 0% finance and free delivery. Rider Height Guidance* 5'4" to 5'7" 5'6" to 5'10" 5'9" to 6'1" 6'0" to 6'5"